Why WOULD you cover that lovely face anyway? If you've ever seen, heard or—if you're really lucky—smelled or felt Tom Hardy, you'll be aware of the fact that he is one of the the HOTTEST humans on planet Earth. I know that's technically a matter of opinion, and beauty is in the eye of the beholder and all that, but c'mon—use your brain. So you may have wondered: Why, in a lot of a lot of his films, does the 39-year-old have most of his lovely, lovely, perfect face covered? Take Mad Max Fury Road for example. Yup, it's 80% covered by a scary mask-cage-thingy. And in the Batman movie, The Dark Knight Rises, his character Bane has his face covered, AND he has a funny muffled voice, so we can't even hear his lovely dulcet tones. Plus, don't get us started on that scraggly beard and bandana combo from The Revenant. So why are directors constantly trying to ruin our fun by hiding him from us? Well Dunkirk and The Dark Knight Rises director, Christopher Nolan, recently revealed there's actually a pretty good reason. Speaking to the Press Association, Christopher said, "I was pretty thrilled with what he did in The Dark Knight Rises with two eyes and couple of eyebrows and a bit of forehead." 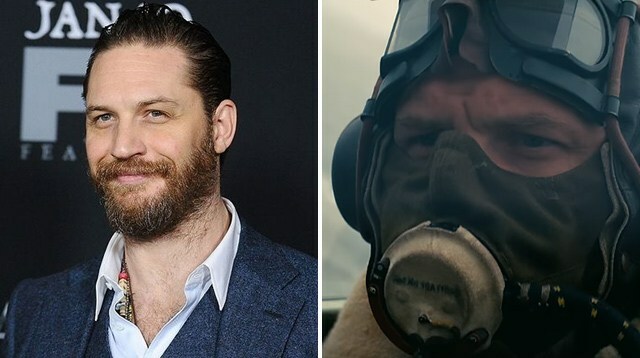 So he wanted to up the ante for his next film with Tom, which perhaps explains his role of a gas-mask-wearing spitfire pilot in Dunkirk. "I thought let's see what he can do with no forehead, no real eyebrows, maybe one eye." Chris added that it's a testament to Tom's acting ability. "Of course Tom, being Tom, what he does with single eye acting is far beyond what anyone else can do with their whole body, that is just the unique talent of the man, he's extraordinary." If you look hard enough, you'll see him reveal his money-maker in the trailer for Dunkirk. But blink and you'll miss it. And you don't want that, do you?